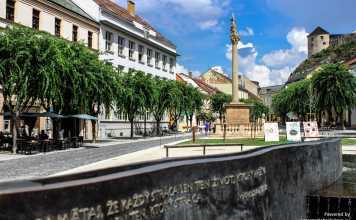 Whether you’re a local on the hunt for an affordable mini-holiday or looking for experiences in Europe that aren’t so “touristy,” Trenčín is a lovely city to explore for the day or use as your home-base when exploring western Slovakia and the Czech border areas. Read on for our guided tour of this delightful city’s most famous spots – and a few tips from the locals on fun dining and nightlife. Enjoy your day trip to Trencin to the fullest! Location! Trenčín’s advantageous location on the Vah River not only helped develop the city’s cute historical center. Many tour-worthy destinations are right here – from Brno and Moravia’s castles to the north, to the neighboring spa towns, you are never more than an afternoon away from new adventures. History Everywhere – Roman centurions once occupied this land, as can be seen on a plaque at the base of the castle. 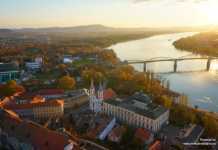 The city has other historical tales to share – a plague in the middle ages, an nine hundred year old town square, and a list of famous residents such as the historical figure Matus Cak Trenciansky, as well as war heros, prolific painters, and epic poets. 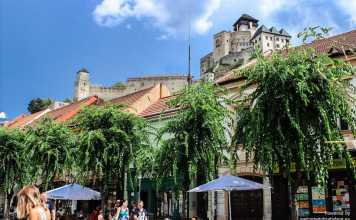 Cafe Culture – there are dozens of sidewalk cafes and hidden coffee shops or wine bars that line the historic streets and popular squares of Trenčín. At night, these quaint coffee houses transform into super cool pubs and event spaces. Home of the POHODA Festival – the most popular multi-genre festival in Slovakia, this three-day event takes place in the beginning of July at Trenčín’s tiny airport and is visited by 30,000 visitors every year! If you prefer a guided tour instead of exploring the city on your own, here is one that we recommend. Trenčín’s proximity to the Vah River isn’t the only nice thing about its location. 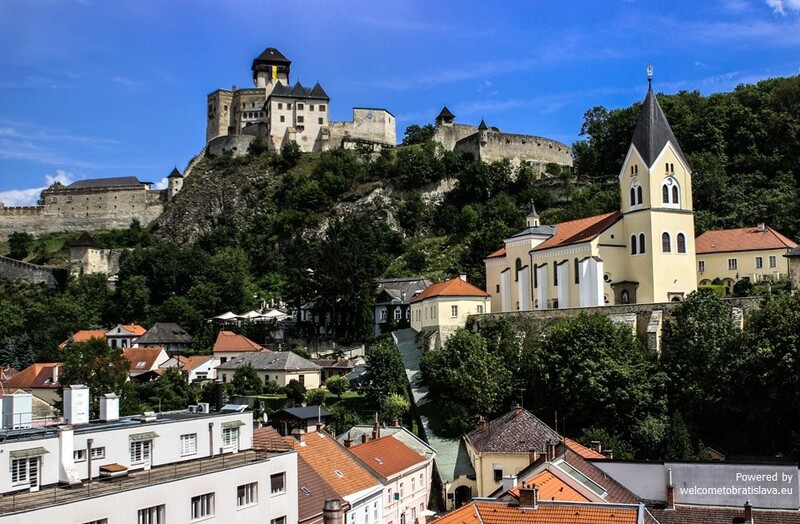 Only an hour car-ride away from Bratislava, getting to and from the city is hassle free. This is especially true if you live near the capital or are visiting Central Europe with a rental car. We can recommend this rental service that we were happy with. Otherwise, we recommend taking a train from the Bratislava main station. The fare is reasonable and it will only take around 80 minutes – plus you won’t have to worry about parking or missing out on sampling the local and beer and wine! For those of you wanting to add the city to your larger travel itinerary, the Czech border just over 20 kilometers north – that’s around 25 minutes by car. 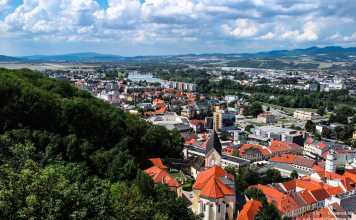 The delightful Brno is relatively close by as well – two and a half hour by convenient train – and Trenčín would be a lovely side-trip or starting out point when visiting there. As with all travel, dress according to the season – layers are key – and try to be flexible in case of unexpected closures or disruptions to your itinerary. That said, the major sights in Trenčín are open most days of the year so you really can’t go wrong with timing. Just keep in mind that July means POHODA and sweltering heat, but it also means Friday night concerts in the park, Sunday theater, farmer’s markets and art shows. 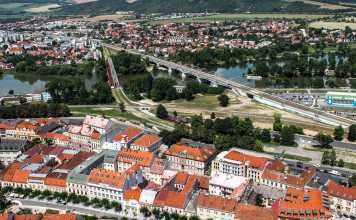 In other words, a summer day trip to Trenčín could easily turn into a weekend getaway – use our guide below as a starting off point any time of the year. PS: If you do decide to spend a few days here or plan on sleeping in Trenčín as part of a larger Central Europe itinerary, we have a few accommodation suggestions below! Welcome to Trenčín! If you arrived here by train you are already in the ideal spot to start your day trip. Get off at Železničná stanica (literally “train station”) and head west through Park of Milan Rastislav Štefánik for a picturesque stroll towards the castle. Notice the small monument to General Milan Rastislav Štefánik, after whom this park is named. Štefánik served as the Minister of War for Czechoslovakia during WWI and championed for the nation’s sovereignty after the war. His legacy was tragically cut short when a plane carrying Štefánik and high-ranking members of the Italian army mysteriously crashed near Bratislava – still a conflict region in 1919 due to disputes between Czechoslovakia and the Hungarian Soviet Republic. With a little “recent” history in mind, make your way up Matúšova Street to a truly historical sight, the 11th century Trenčín Castle. Strategically perched on a cliff overlooking the Vah River and its surrounding valleys, Trenčín Castle is an excellent starting point for familiarizing yourself with the city below. Throughout the history of this region, the Vah has been an important trade route and controlling the areas around it meant prosperity and power. In WWII, when the goal was territory rather than trade, many battle were fought near here. While the parts of the existing structure are an impressive 900 years old, the site has been historically significant for almost two thousand years. You read that right – the oldest written artifact in Slovakia is in fact Roman, a plaque from 179 AD on the cliffs below the castle marks the the site of Laugaricio military camp and represents the most northern boundary of Rome’s military prowess. Since you can only see this plaque from the terrace of Elizabeth Hotel, we recommend stopping in for a drink after your castle tour. You’ll be exercising your own prowess as you trek up the steep rocky cliff towards the castle’s museum and look-out points. Honestly, this is a hike and may be quite strenuous for some. If you are visiting during the 30 degree summer or with small children, consider enjoying the view from below and visiting the birth house of Vojtech Zamarovsky, the first Slovak non-fiction author and historian. The site currently it hosts Workshop P2Pottery and you can see (and buy) replicas of prehistoric ceramics. Just don’t worry about missing out – for our money the best view in town is from the City Tower (more on that later). From a museum standpoint, the castle is affordable and actually offers two tours – guided and non-guided – to help you better navigate yourself around the various structures inside within the castle walls. During peak season tours run until 19:00 (last tour starts at 17:30), meaning you don’t have to feel rushed as you soak in the history! 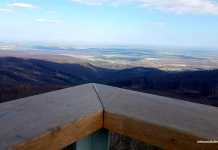 Starting your day trip here is a great way to get perspective on the city, literally and figuratively. Take a long look around before heading back down the hill towards Trenčianske múzeum – Katov dom – the Executioner’s House! While it is not 100% certain that an executioner – or “headsman” – lived here, it is known this likely served as the home of the local sheriff and was connected to an adjacent jail in the 19th century. What is known is that the house was built in the late 1580’s in the gothic style and, after a later reconstruction, now remains the only original Renaissance-style home in Trenčín. Now filled with authentic tools and artefacts, this tiny two-room museum offers excellent explanations of the weapons on display, as well as plenty of interesting information about the house and history of justice during the medieval and Renaissance periods. Katov dom is a quick, but worthwhile stop on your tour of the city. Opening hours are similar to the castle’s and at the time of writing entry fee is only a euro. As you leave the museum, take the opportunity to visit the Zamarovsky pottery workshop for truly unique souvenirs that we already mentioned (just a few quick left-turns and you’ll be there in 2 minutes). Or while you’re here stop by the Charnel House for it’s collection of 15th century religious art. If you’re like us, however, it’s time for a pick-me-up after all that walking. Wind your way down the ultra charming cobblestone path of the Marcus Aurelius Street and on your right is the darling Coffee Sheep, a local favorite that boasts its own roastery and live entertainment. Hot tip if you’re staying over the weekend – on Fridays they stay open until 2am! For something more substantial food-wise, we highly recommend Café Sládkovič (details and awesome pictures under “Food Scene & Nightlife” of this article). To get there, stay on Matúšova Street towards Hotel Elizabeth and make a left on Mierové Square. Whether buzzing your way from Coffee Sheep or feeling fueled after a stop at Café Sládkovič, head straight towards Mierové Square. This is the real center of all the local happenings and a charming place to spend a relaxing afternoon people watching and taking in the scene. Mierové means “peaceful” or “pacifist” and the square was renamed in 1962 to reflect (or perhaps reinforce) political sentiments of brotherhood and unity. Today, this branding remains totally apt. Mierové Square has a great vibe, tons of nice coffee shops and cute restaurants, and perfect views of Trenčín Castle to the east and the Piaristic Church of St. Francis Xaversky just west of the square. Also dotted along the square’s interesting rectangular shape are reminders of the city’s history. The square itself has been surrounded by the life of the city since around 1100 CE, when the road leading from the river to the castle helped shape the original settlement here and, by default, literally created the town square. While early common-era buildings and medieval city walls no longer stand, it’s easy to imagine what the bustle of everyday life might have been like. Notice the tall column near the fountain? This striking pillar commemorates the victims of Trenčín’s 1710 plague. In fact, the same stone-cutters who restored the Piarist Church after the fire of 1708 left it demolished (on your left if facing the Vah River) helped construct this memorial. That was a rough decade! Nearby is a happier reminder of the past – a bust of Jozef Branecký, a priest and important novelist and historian. Branecký is especially revered for the focus on Trenčín history and folklore in his works. If you have the time, and the doors are open, we recommend taking a small detour and visit the Piaristic Church, just up ahead. The interior is considered to be one of the most exquisite examples of sacral baroque monuments in Slovakia. Admission is based on donation and open to the public before and after mass. Once you’ve looked around – or if you choose to skip it – reward yourself with a giant pancake from Mak Palacinkaren (see below). You’ve earned it after all that walking! As you head towards the last two sights on your day tour, take the opportunity to walk through the Parish Stairway. The small entrance can be found where Mierové námestie and Farská Street merge. Farská means “parish” and up ahead, towering above you, is the Parish Church of the Birth of Virgin Mary. While this church looks new (and is by relative standards), the site has been home to this parish since 1324. The Parish Stairway has been used since the renaissance and used to serve as an access road to the town armory. Thankfully for us, it now serves as a great short-cut to our next stop. For those of you who live in or have visited Bratislava, the City Tower may remind you a little of a stripped-down Michalská Brána – St. Michael’s Gate. Though built 100 years apart, both towers have a history of being used to defend their cities and are now home to rustic military exhibits. Even more important, just like the tower in the capital you can climb a set of winding stairs all the way to the top for the best view in the city! And really, this is a breathtaking view – you can see the castle, Mierove Square, the synagogue (our last stop on the tour); you can even see your house from up here! Okay, we’re obviously joking, but the view really is impressive. If you are visiting during the summer, during peak season and POHODA activities, the sun is still shining all during the opening hours and climbing to the top can be a nice escape from the crowds below. Especially during winter, however, you can also enjoy the pretty, twinkling night view. Just because the days are shorter, doesn’t mean the fun stops. The cheap admission (around 1 EUR) is the best buck you can spend in town. The last major site on your tour, and perhaps the highlight of our visit after that magnificent view, is the Synagogue. Given the troublesome history of Jewish culture in Europe, it is rare to find pre-world war synagogues in original condition. Trenčín’s synagogue is no different – during the 2nd world war the building was desecrated and looted. Miraculously, the original blue-domed ceilings and ornate chandelier survived. Skillfully placed skylights and multi-colored window panes lend a magical touch to the space when the lighting is just right. Today the synagogue is occasionally used as an exhibition space for artwork, with a small worship room in the rear. This peaceful place of contemplation, once the scene of tragic desecration, is a good place to pause and reflect on the journey of this city – from plagues to POHODA – as well as your own little journey today. Stepping back outside you’ll see a funny, water-spitting statue of a vodnik – a Slovak water nymph notorious for stealing souls of unsuspecting children. But Trenčín’s Vodnik was different. He fell in love with a local girl and secretly helped her with her daily chores. When the maiden discovered this secret helper was vodnik, their love story almost came to end. No surprise, the pair found a happy ending – much like the city itself. But enough sappy reflection – if you’re like us, you’re hungry again! Luckily, this city has some great spots for small bites and nice drinks. We’ve already talked about the local favorite Cafe Sheep. Here are some darling places we recommend you patronize during your visit. Dedicated to the Slovak writer Andrej Sladkovic, a romanticism era poet famous for penning the longest love poem in the world (“Marina” is serious reading at almost 3000 lines), this three-room cafe is delightful and serves amazing coffee and cakes. The snacks are pretty good, though the selection is on the smaller side. We felt at home here, as if already knew the team and had visited before. Wait – maybe that’s because you can literally learn about Náš Tím (“our team”) on their website ;) Even without the personal touch, we like the museum-feel of this cafe. Playing off the historic vibe of Trenčín, Cafe Sladkovic is set up so one room is dedicated to Sladkovic himself and the other two are themed around his two most epic works – “Marina” and “Detvan.” Free exhibit with your káva, anyone? PS – On Friday and Saturday Sladkovic will keep you buzzing until midnight! Mak Palacinkaren is a tiny place with only few tables. What it lacks in square meters, it gains in location and portion size. Dine here for a great view of Mierove Square’s hubbub year round. Mak is a another local favorite, so expect it to get quite full. Better people watching for you! Quick Slovak lesson – palacinka means “pancake” and mak means “poppy seed.” That’s not what you’ll be getting here. Think crepes instead – sweet ones with chocolate and ice cream and savory ones with bryndza, mini slabs of bacon, and sour cream. They also offer a daily soup and it is biggest portion we had seen lately. The prices are great, too. Okay so you’ve had your coffee and filled up on giant pancakes. Head back to Mierove Square (or just wander a bit if already there) for a really neat cafe that doubles as a live music venue and cool-kid bar during the evenings. We really liked Paddock as a concept and were delighted by the young friendly staff and great vibe. During the day it functions well enough as a coffee shop with Instagram worthy cakes, but at night it really comes alive. Every weekend sees a unique event – like open-air screenings of your favorite movies (who doesn’t like “Inglorious Bastards”?) or music and art themed parties designed to make you contemplate the scene. Plus the outdoor setting almost reminds us of a Budapest ruinpub! It’s very charming and open until 2am on weekends. Of course there are other great places to try during your stay, too. If you like sushi, the sleek and modern Oyshi is highly reviewed. And .KUKI offers craft beer, burgers, and sometimes even donuts which is a pretty good reason to spend the night here for a morning sugar fix. Speaking of which . . .
With lots more to see and do here (from taking in the excellent Slovak 20th century art of Miloš Alexander Bazovský to experiencing a romanesque wellness day at Caracalla Spa) you may choose to extend your afternoon into full-fledged mini getaway. And if you do, make sure to visit Cachtice or Beckov Castle – about 30 minutes by car from your homebase in Trenčín. For the budget minded, the super adorable (and pet friendly!) Penzión Panoráma has solid reviews and reasonable starting rates, around 50 EUR a night in low season. The central location is pretty nice, too. Of course these days it’s easy enough to rent an apartment and if “playing house” in another city is your thing, it can be a great option. Especially during the spring and summer during farmer’s market season. If you’re truly planning to make your visit here an event, consider staying at Hotel Elisabeth – awarded the most beautiful city hotel in Europe in 2016. Yes, it can be pricey to stay here – check out their pretty cool package deals though – but we really think it’s worth it. At the very least, enjoy a coffee or glass of Slovak wine on their terrace. You wont regret it. We hope you liked our day trip to Trenčín guide. If we missed anything, let us know – we can’t wait to visit again soon!